The following post from Skeptical Science is by Jeremy Weiss, lead author of Implications of Recent Sea Level Rise Science for Low-elevation Areas in Coastal Cities of the Conterminous USA. 1967, Jimi Hendrix writes a melancholy poem, reverses guitar tracks, and records a classic hit. By all accounts, he isn't thinking about rising sea levels. For cities and towns along the coasts of the U.S.A. - our castles, if you will - we weren't thinking of rising sea levels in 1967 either, much less the potential impacts from the creeping phenomenon. We think about this now because our knowledge of global sea level rise as a result of human-caused climate change has grown rapidly in recent years. Independent estimates now indicate that global sea level could be 1 meter (3.3 feet) higher by 2100. In a study recently published in Climatic Change, we delineated low-lying coastal areas of the conterminous USA that may confront impacts from rising sea levels. We found that an average of 9% of the land area in coastal cities and towns lies at or below 1 meter of elevation and is connected to the sea. For highly populated municipalities - those with more than 300,000 people - land area percentages at or below 1 meter are greater than the national average in New Orleans, Virginia Beach, VA, Miami, and Tampa, FL. But is the amount that sea level rises over the next 90 years the only sea level issue to consider by century's end? No, it's not, and here's why. We're currently on track to warm the planet by 8° Fahrenheit by 2100. That amount of warming will likely lock us into a sea level rise over subsequent centuries of at least 4-6 meters of at least 4 to 6 meters, at rates up to 1 meter per century. That's because under this much warmth, parts of Greenland and Antarctica - the great polar ice sheets - will slowly melt and waste away like a block of ice on the sidewalk in the summertime. Eventually. Consider it our commitment to higher sea levels in the year 2100. In total, 180 coastal municipalities in the conterminous U.S.A. with populations over 50,000 have an average of 36% of their land area at or below 6 meters of elevation and connected to the sea. Twenty of those have populations greater than 300,000. 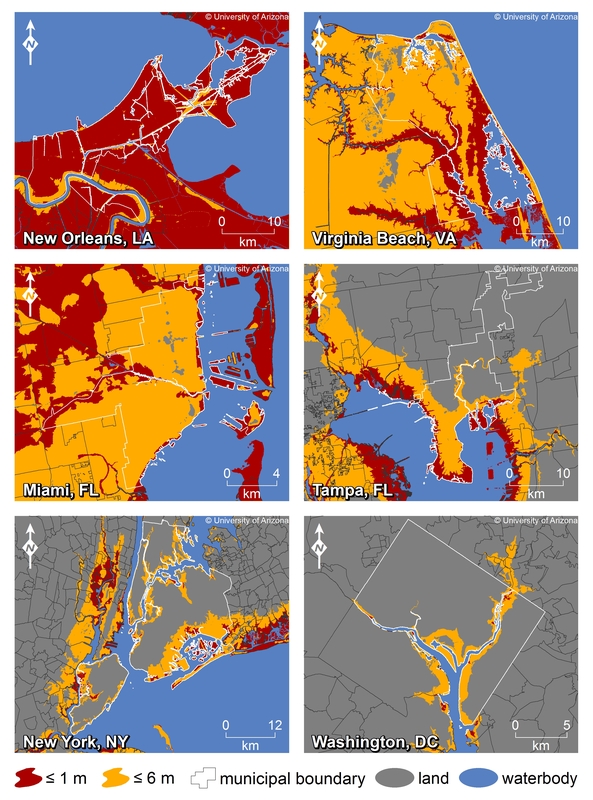 How rising seas impact coastal municipalities through erosion, temporary flooding, and permanent inundation will very much depend on which city or town you are in. On top of that, some municipalities will have a lot of area potentially impacted by higher sea levels whereas others will have relatively little. So, what they do to face rising seas in New York may not be the same as what they do in Miami or Los Angeles. Again, a much larger version of this image is available at Skeptical Science. 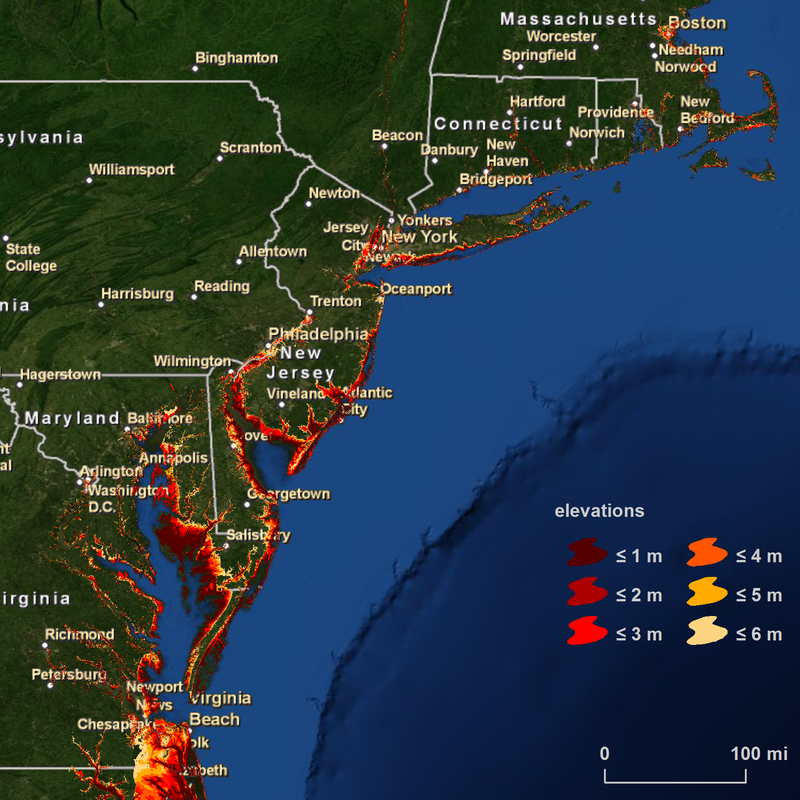 Red areas are those affected by 1m sea level rise (by 2100), yellow is 6m (coming centuries). The national and international dimensions of and efforts to curb human-caused climate change are in stark contrast to the very local, and disproportionate, potential impacts of higher sea levels. One of our most popular landscapes to live and recreate in - the coast - is looking squarely at major changes from rising seas by the end of this century and beyond. Eventually, we will find out if our castles are made of sand. Two Meter Sea Level Rise Now Inevitable - But How Fast Will It Happen?